An easily installed 20m webbing temporary lifeline provides the operator the benefit of horizontal mobility. The UV stabilised heavy duty webbing is tensioned by a ratchet, with any spare webbing stored in the attached carry bag. Lightweight, easy to handle and its versatility make the B-Safe Temporarily Horizontal lifeline ideal for general construction, maintenance and contractors where the worksite is constantly evolving. Vertical Safety Lines can be set up on a temporary or permanent basis. The purposes of these lines are for climbing structures and being attached whilst climbing or traversing the structure. It is important that the top attachment point is suitable for the application and rated accordingly. When taking the line off the direct vertical position, users have to be aware of the possible pendulum effect should a slip or fall occur. The safety line should be used under tension between the anchor and the rope grab device so that the fall distance is limited to the operational speed of the rope grab. 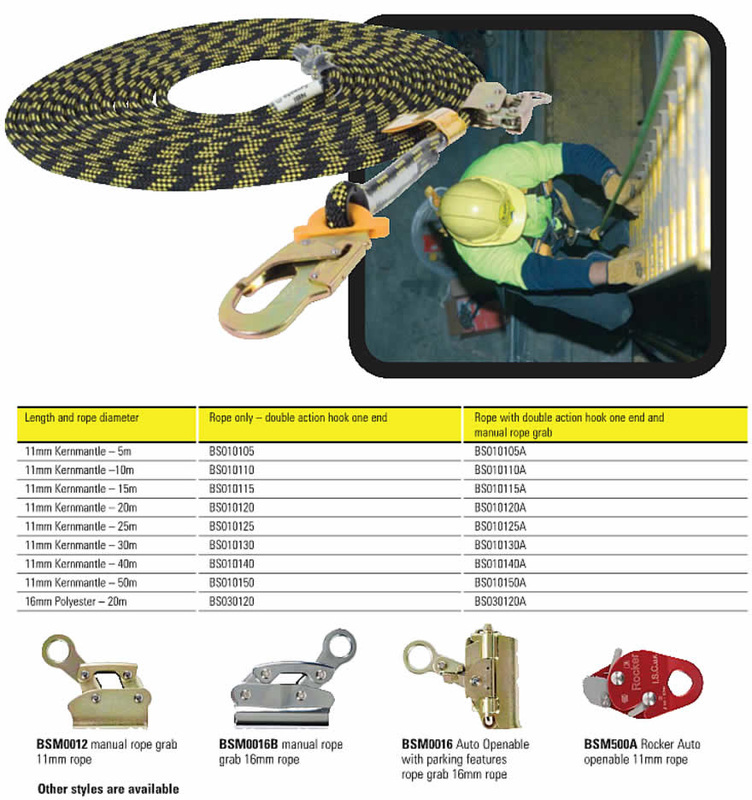 Various versions of the rope grab are available, types that slide on the end of the rope and require manual releasing to descend and automatic openable devices that will freely travel up and down the rope.